Written and illustrated by Annie White, 'Clementine's Walk' is a lovely family adventure. Clementine is intent on finding someone to take her for a walk, but everyone is just too busy. When they finally find the time, Clementine is nowhere to be found. Help the family to find Clementine in this adorable adventure using the puzzle, soundboard and question features. - Allows independent play. 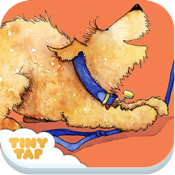 'Clementine's Walk' is created using TinyTap.